FIFA banned Uruguay striker Luis Suarez from all football activities for four months on Thursday for biting an opponent at the World Cup, a punishment that rules him out of the rest of the tournament and the start of the upcoming Premier League season. The ban also covers Uruguay's next nine international games, which goes beyond the next four months and rules him out of next year's Copa America. FIFA also fined the Liverpool striker 100,000 Swiss francs ($112,000). 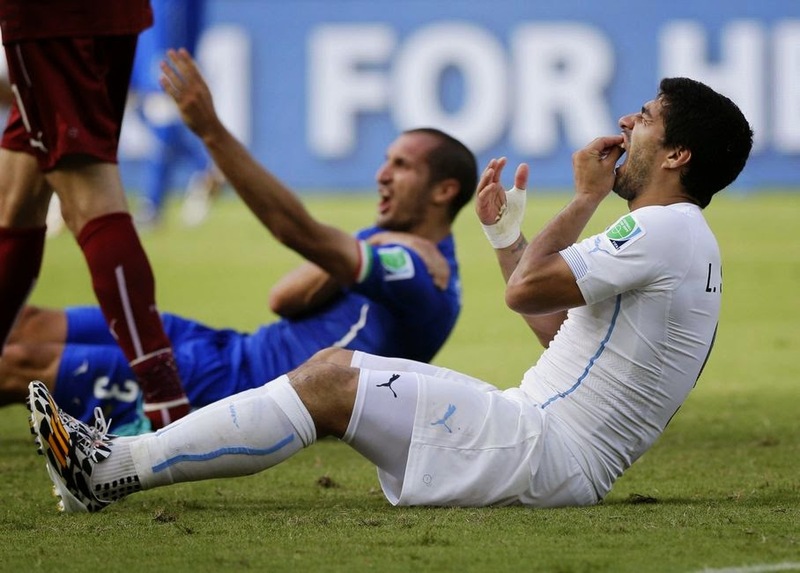 Suarez bit the shoulder of Italy defender Giorgio Chiellini during Uruguay's 1-0 win in the group stage, but escaped unpunished as the referee did not see the incident. "Such behavior cannot be tolerated on any football pitch and in particular not at a FIFA World Cup, when the eyes of millions of people are on the stars on the field," Claudio Sulser, chairman of the FIFA disciplinary committee, said in a statement. There was no immediate reaction from the Uruguay team. This is the third time Suarez has been banned for biting an opponent after similar incidents with Ajax in the Dutch league and Liverpool. He was given a 10-match ban by the Premier League for biting Chelsea defender Branislav Ivanovic toward the end of the 2012-13 season. The FIFA ban is effective immediately, meaning Suarez will miss Uruguay's round-of-16 game against Colombia on Saturday. By banning Suarez from all football activities, FIFA also prohibited Suarez from entering a stadium at the World Cup. It also stops him from even training with Liverpool until the ban ends in late October. "He cannot be actively involved" with a club, FIFA spokeswoman Delia Fischer said. Suarez and the Uruguay football federation can appeal the sanctions, though Liverpool could not be formally involved in any legal challenge, Fischer said. The four-month ban includes Liverpool's first three Champions League group-stage games in the five-time European champion's return after a five-year absence. Suarez will also miss the first nine matches of the Premier League. Fischer said Suarez would still be allowed transfer to a different club during the ban, but would not be able to play for a new club until the sanction ends. Fischer said any appeal must first go to the FIFA appeal committee. If rejected, Suarez and Uruguay could take the case to the Court of Arbitration for Sport in Lausanne, Switzerland. At CAS, Suarez could first appeal to have the sanctions frozen during the process which would clear him to return early for Liverpool. In a statement, Liverpool chief executive Ian Ayre said the club "will wait until we have seen and had time to review the FIFA Disciplinary Committee report before making any further comment."